The U.S. Environmental Protection Agency (EPA) offers a free “Simplified GHG [greenhouse gas] Emissions Calculator” to help small businesses get started. Another option is to enroll in TerraPass’s “Carbon Balanced Business” program, which helps commercial entities measure and then offset the greenhouse gas emissions they are responsible for generating. Beyond carbon footprints, there are many other things businesses can do to minimize their environmental impacts. The non-profit Natural Resources Defense Council (NRDC) reports that, first and foremost, businesses should shift the paper paradigm—the average office tosses out about 350 pounds of paper per year per employee. “Reducing your waste and purchasing paper with post-consumer recycled content can help save trees and nudge the pulp and paper industry, one of the most environmentally destructive industries in the world, toward a less damaging path,” NRDC reports. Some easy ways to do this include: setting printers to use both sides of a page (or designating a “draft tray” filled with paper that’s blank on one side); buying copy paper with a 30 percent or more post-consumer recycled content; collecting used paper separately for recycling; and stocking bathrooms with post-consumer recycled tissue products. Getting more energy efficient is another way to save the Earth while saving money too. NRDC recommends taking advantage of the fact that most utilities offer free or inexpensive energy audits, whereby an engineer examines operations and provides a report about how to save on energy costs. Turning off lights and electronics at the end of the work day can save bundles of energy. “Plug all your appliances into a power strip and you’ll only have to flip one switch at the end of the day,” suggests NRDC. Also, setting computers to “sleep” or “hibernate” when inactive will further reduce a business’s footprint. And NRDC says to lose the screensavers: “Flying toasters and slideshows can use up about $50 of electricity in a year.” Lastly, when shopping for new office appliances, look for the EnergyStar label which means that the federal government has rated the particular unit highly in terms of energy efficiency. Cutting water waste will also make a business run greener. The group says to install faucet aerators and low-flow toilets, check for and fix leaks, landscape with water efficiency in mind and recycle gray water where applicable for nonpotable uses such as watering gardens. Lastly, NRDC suggests creating a greener work environment, given that “employees are on the front lines of any sustainability initiatives” a business chooses to make—perhaps by creating a green team “with members from all divisions of the organization to help implement plans and bring new ideas to the table.” Those looking to take their businesses down a green path should consult any of the free “Greening Your Business” guides on NRDC’s website. CONTACTS: EPA, www.epa.gov/climateleadership/smallbiz/footprint.html; NRDC Greening Your Business, www.nrdc.org/cities/living/gbusiness.asp. Gasoline-powered passenger cars plying American roads have been subject to strict pollution limits for some three decades already, but only recently have tougher standards for diesel-powered trucks, trains, barges and other soot-belching vehicles gone on the books across the country. 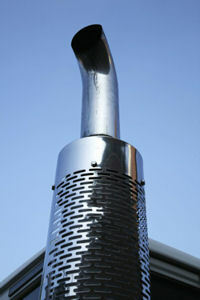 Traditionally, older diesel engines produce less carbon dioxide per mile driven than gasoline-powered vehicles, but they produce more of the pollution associated with localized environmental trauma—such as smog and soot in the air—that can trigger respiratory and cardiovascular problems and have been linked to lung and other cancers. Thanks to the work of the Environmental Defense Fund (EDF), American Lung Association (ALA) and others, though, the U.S. government has adopted increasingly stringent rules governing how much particulate pollution and other toxins are allowed to come out of diesel engines. In 2001, these groups convinced Congress to pass strict new pollution limits on heavy-duty trucks and buses. Three years later similarl standards were applied for non-road vehicles, including construction and farm equipment. These laws were designed to clean up new diesel engines, but the millions of older diesel engines still on American roads, work sites and waterways continue to cause pollution problems. Newer state laws in California, Texas and New York calling on owners of older diesel vehicles to retrofit their engines with emissions reduction equipment has helped clean the air in those states. And regional public-private partnerships administered by the U.S. Environmental Protection Agency’s National Clean Diesel Campaign have also helped put a dent in diesel emissions from the trucking, rail and shipping sectors. Even though the clean-up of diesel engines has only been mandated in the U.S. within the last 10 years, the positive effects are already noticeable. A recent report (“State of the Air: 2012”) issued by the ALA found that, in urban areas across the U.S., ozone-causing smog is down 13 percent, soot levels are 24 percent lower and short-term particulate pollution is down some 28 percent over the last decade. Meanwhile, California’s Diesel Risk Reduction Plan, which calls for cleaner-burning diesel fuels, retrofitting of older engines with particle-trapping filters, and the use in new diesel engines of advanced technologies that yield some 90 percent fewer particle emissions, has already cut diesel particle emissions by 75 percent there, with 10 more percentage points worth of clean-up expected by 2020. “Together, these regulations will prevent tens of thousands of deaths and hospitalizations each year,” reports EDF. “The billions of dollars in public health benefits far outweigh the costs of controlling pollution.” Green leaders concede we still have lots of work to do on the issue, given that 40 percent of the U.S. population still lives in areas with unsafe levels of smog and soot pollution. But there is optimism that pollution reduction policies like California’s will soon be standard elsewhere as well, making our air even cleaner and reducing the percentage of Americans living in areas with compromised air quality. CONTACTS: EDF, www.edf.org; EPA’s National Clean Diesel Campaign, www.epa.gov/diesel; ALA’s State of the Air 2012, www.stateoftheair.org/2012/assets/state-of-the-air2012.pdf; California’s Diesel Risk Reduction Plan, www.arb.ca.gov/diesel/documents/rrpapp.htm.